“Mom, help me…” my son whines when asked to complete a simple, everyday task. “I can’t.” I carry on with what I was doing. “But, Mom…” He begins to wind himself into a tantrum. “I’m sorry. I cannot help you.” I stand firm. Conversations like this have been unfolding often in my home. In fact, this one happened just last night. 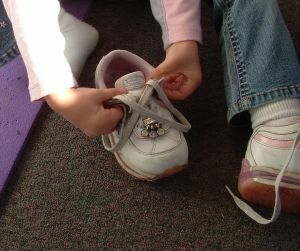 You see, one day after reaching an apex of frustration over something as trivial as getting on socks and shoes, I asked myself, When did my children go from their toddler and preschooler attitude of “I can do it myself!” to their current complaints of helplessness. And, Why? The answer hit me hard: Because I let it. I did things for my children that they could do themselves for no other reason than to get those things done faster. Instead of offering consistent room for trial, error and success, I had increasingly trapped my family in a modern phenomena that is a bane to self-sufficiency: busyness. It’s awfully difficult to learn how to tie shoes when rushing out the door. “Hurry up. We’re late,” does not leave much room for “Hang on, Mom, I’m still mastering how to get my shoes on right.” Or, fixing my hair. Or, folding and putting away my clothes instead of throwing them on the floor or in the laundry pile. Or, tidying up what I was just doing instead of leaving it as mess to add to later. Not that my children would ever say such words to me, but their actions speak them loudly. When I add just a bit more margin space to our schedule on any given day, I find that my children become a lot more adept at doing things for themselves. In fact, when I stop “helping” my children to do things faster in lieu of offering them time to do the same things on their own, I recognize a truth: Just a little more time can result in a whole lot more success. My children can do so much for themselves already, and, increasingly I recognize that they can do even more when I just remember to offer them a few extra moments to fumble through their learning curves. Indeed, today’s time-consuming mastery can become tomorrow’s peaceful proficiency. Children can do so much for themselves…when we let them. Might you begin offering your children more unhurried, natural opportunities to master skills, too? This really hit home with me. I so often do things that they can and should do on their own. Then when I insist they do things, they think they can’t. The days are flying by and yet I can’t seem to slow down one bit. It’s true. When did we all get to be in such an unorganized rush?! I hate it.